a. Sleeved. Sleeves should hang at least to the wrist when the arms are held down at the side. b. Martial arts clothing in any form is unapprovable. c. OTs can be sleeveless as long as an Inner Tunic (IT) is worn and is long sleeved. No bare-armed Generic Jedi. d. OTs have a collar approximately 2 inches (5 cm) wide. e. OTs length may be variable and can extend to the floor. OTs minimal length should be long enough to cover the wearer’s buttocks and crotch area. Mid-thigh is optimal. OTs are generally made in a fashion where there is a full skirt (attached to the main body of the OT) where the seam is hidden by the obi. f. OTs minimum length must cover crotch and buttocks, when wearing pants. Like OTs, they are floor length. When a dress, no skirt and pants are needed. a. Pants should be nondescript without decoration. Traditional pants pockets are permitted, but must not be visible (e.g., hidden under the skirt of the OT). d. No Corellian Blood Stripes (Han Solo Pants). e. Skirts (those separate from the OT) are floor length. There are geometrical pattern on the tabards. a. Front tabards do not overlap, but can touch under the obi. Tabards may cross in the back. e. Leather or pleather tabards permitted. f. Tabard width should be from the seam at the collar of the OT to the edge of the shoulder and be a similar width as the obi. A general width to use would be 5 inches to 6 inches wide (depending on one’s height and build). Common sense should be used in selecting tabard width, and the width is proportional to the costumer’s body. The obi wraps around the waist, and is approximately 4 to 6 inches wide and/or of a similar width as the tabards. a. Skirts (those separate from the OT) are floor length. a. Pants should be non-descript without decoration. Traditional pants pockets are permitted, but must not be visible (e.g. hidden under the skirt of the OT). Footwear is low heeled and closed-toed. a. Mid-calf, but not above the knee (motorcycle boots, or “engineer” boots, ~14 inches). Extensions are allowed). d. Buckles are permitted, but should complement the boot and not detract from the overall look of the Jedi costume. e. Low-heeled 1 to 1 1/2 inches maximum. f. Mini-Chaps (not above the knee) are allowed. 1. Librarian Tools: Example Jocasta Nu. 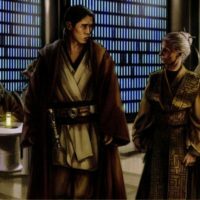 Large Jedi robe or cloak (cape) with attached over-sized hood, similar to Prequel movie canon robes/cloaks. a. A hooded cape with side splits is permitted. e. The length of the robe or cloak/cape should be hemmed no shorter than two inches off the floor. Big brown suede pouch on below the obi rounded and gathered with a thick cord at the top (drawstring type).